Like me, if you had thought that a tart concept can be done with either with home made/ store brought old fashioned buttery crusts or phyllo pastry or puff pastry, you will be happy to know that you can make something nice with the humble yeast dough as well. Meaning, you don't have to slave over making phyllo or puff pastry (or be lucky enough to easily buy them) or master the art of baking the perfect pie crust and still get away with making something that classifies as a tart and a pretty good one at that. Without having to plan ahead for it. As in you can get up in the morning or come back from work and still decide to bake yourself a tart. Easy and quick. I have realized that when you bake something like a pizza or tart with a slow-risen base like Peter Reinhart's pizza dough, you can get away with minimal and the simplest of toppings as the very flavorful base takes center-stage here. And when you bake with the faster ones, you are better off allowing the topping to take center-stage. Bake with a flavorful base and flavorful toppings, danger is you will end up making it every now and then, for very given excuse. Did I tell you that Peter R's crust has become a real real favorite with me and have made it at least about 5-6 times by now? When Madhuli invited us to bake tarts for an event at Chef At Large, I wanted to play around with a quick yeast dough base and top it with something delicious and indulgent too - the festive air squarely to blame. 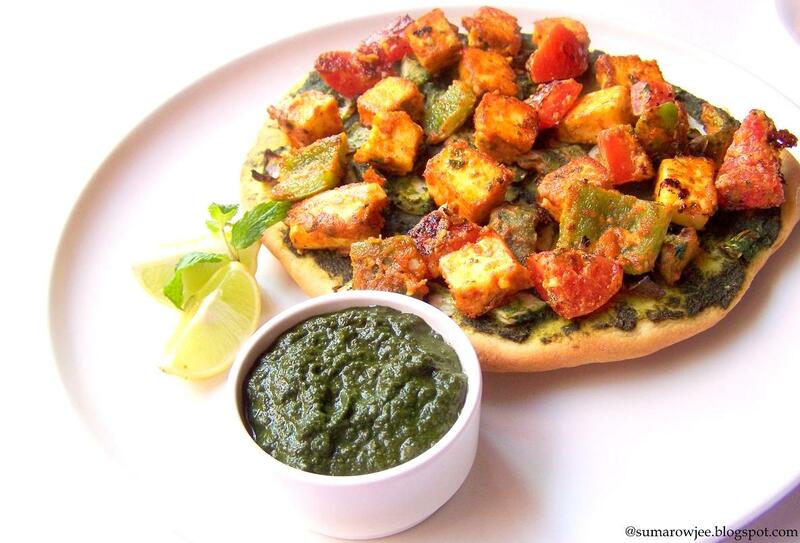 Hmm... may be a tart topped with mint and coriander chutney, loaded with some flavorful paneer tikka? Why not? A bit of work with the tikka and some time to marinate the cheese and veggies, but the dough is a breeze as always these days with my bread machine! The paneer tikka turned out good and I had a tough time keeping the kids away till I put it all together and took the mandatory pics, but it sure made me happy! This said, the base and the tikka is only a suggestion, feel free to use your favorite pizza base and your favorite tikka topping! Coriander and mint chutney - 4 tablespoons plus more to serve on the side. Getting ready : To make the tart, make sure the paneer and veggies are marinated and ready to go on the tawa before you make the dough. Generously grease your baking tray or trays with oil. I place my pizzas and tarts on the back of my 9'' square/round tins, for ease to slice them later. Paneer Tikka : Adapted from a Sanjeev Kapoor recipe. Good quality paneer, needless to say makes a lot of difference. I used Nandini, Milky Mist is supposed to be good too. Do use home-made paneer if you have it on hand. Do not cube the cottage cheese too small or it will be difficult to thread the cubes through a skewer or flip them when directly placed on the tawa. Procedure : Whisk together all the ingredients for the marinade in a wide bowl, gently toss in the paneer and capsicum cubes to coat with the marinade well. Cover and refrigerate for 2 hours. You could toss in the onions and tomatoes later (after you fish out the paneer and capsicum), there will still be marinade left. I did not add them earlier as they will leave out more water, wanted the paneer generously coated with the marinade. Heat a non-stick pan, brush oil generously using a silicon brush. Thread the paneer and the vegetables through skewers (or just place directly, flipping now and then using 2 spoons) and cook on medium-low heat, turning them to cook all sides till a nice golden and done (this will not take more than a say, 3-4 minutes) Do not over-cook as this will make the paneer tough. Reserve. Blend everything using little or no water. Check and adjust seasoning. Reserve. Tart base, adapted from Purple Foodie original recipe from Popina Book Of Baking I have used yogurt in place of the egg, stepped up on the salt and yeast, and added a bit of garlic to the base. Procedure : Mise en place. Sift together the flour and salt. Take the oil and garlic in a small pan, warm the oil. Take off the heat. If using crushed garlic, you can discard it once the flavor is infused into the oil. Take the warm water in a wide medium sized bowl, mix together all the dough ingredients and knead to form a soft, smooth dough, about 8-10 minutes. If using a bread machine dump all ingredients together and knead on dough cycle for 10 minutes. Lightly grease your dough rising bucket, place the dough in it, turn it once to coat the dough with oil. Cover and let rise in a warm place till double in volume, about 40 minutes to one hour. Towards the end of the rise period, pre-heat oven to 190 degrees C / 375 degrees F. Gently punch down the dough, divide into 2 equal portions. Dust your work surface lightly with flour. Roll one portion of the dough about 5-6mm thick and about 7 '' inches in diameter. This will give you a slightly crisp, bread-y base. Place the rolled dough on the greased tray. Spread about 1 1/2 - 2 tablespoons chutney and place about 1/4 cup cubed onion on it evenly. Bake for about 20-25 minutes or till the edges turn a nice golden brown. If you bake longer, the base will be crunchy-crisp. Remove from the oven, cool for about 10 minutes. Brush with more chutney, top with half the warm paneer tikka, sprinkle some chaat masala, cut into wedges and serve immediately. Repeat with the other portion of dough. I bake simultaneously in my microwave and OTG. Make ahead : Make the chutney, marinate the paneer and veggies. Refrigerate both. Make the dough when needed and you are ready to go! The paneer-tikka tart is Yeast-spotted!! drooling here!!! amazing and so tempting!! bookmarking it! Loving this desi version of tart, with those paneer tikka cubes, can guess how divine this tart will be. looks so yummy. I am drooling here. Love the beautiful clicks. Looks awesome. Would love a slice. 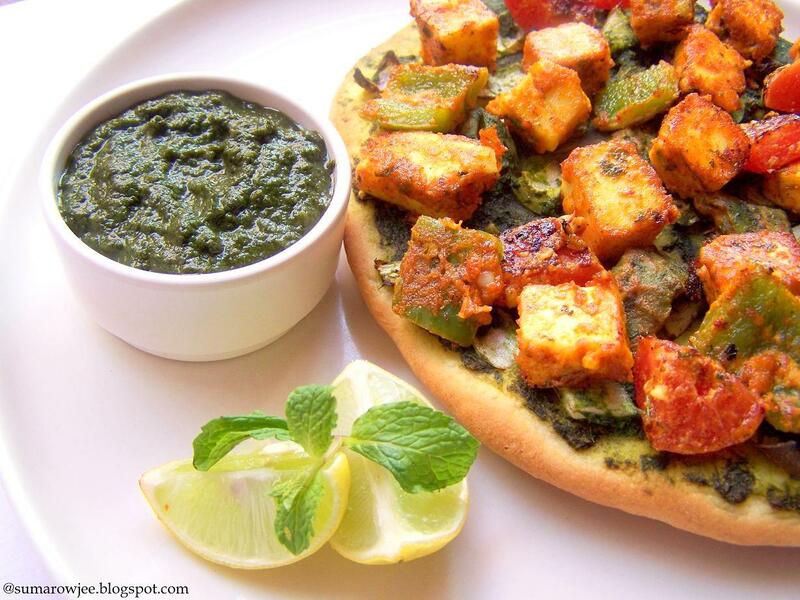 I am loving this Indianized version of tart with spicy paneer tikka! 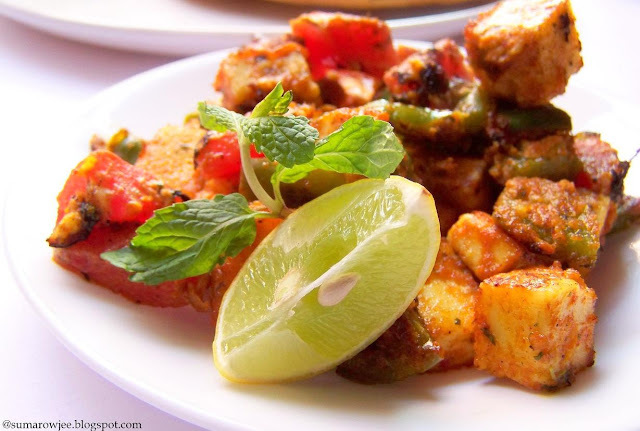 Paneer tikka looks yummy!! I wanna run to the indian store and buy paneer this instant! !